The right balance of zinc and zirconium oxides in this catalyst (purple block) converts ethanol to isobutene with low amounts of unwanted byproducts such as acetone and ethylene. RICHLAND, Wash. — Researchers in the Pacific Northwest have developed a new catalyst material that could replace chemicals currently derived from petroleum and be the basis for more environmentally friendly products including octane-boosting gas and fuel additives, bio-based rubber for tires and a safer solvent for the chemicals industry. To make sustainable biofuels, producers want to ferment ethanol from nonfood plant matter such as cornstalks and weeds. Currently, so-called bio-ethanol's main values are as a non-polluting replacement for octane-boosting fuel additives to prevent engine knocking and as a renewable replacement for a certain percentage of gasoline. To turn bio-ethanol into other useful products, researchers at the Department of Energy's Pacific Northwest National Laboratory and at Washington State University have developed a new catalyst material that will convert it into a chemical called isobutene. And it can do so in one production step, which can reduce costs. Reported by researchers in the Institute for Integrated Catalysis at PNNL and in the Gene and Linda Voiland School of Chemical Engineering and Bioengineering at WSU, the findings appeared July 21 in the Journal of the American Chemical Society. "Isobutene is a versatile chemical that could expand the applications for sustainably produced bio-ethanol," said chemical engineer Yong Wang, who has a joint appointment at PNNL in Richland, Wash. and at WSU in Pullman, Wash., and leads research efforts at both institutions. In addition, this catalyst requires the presence of water, allowing producers to use dilute and cheaper bio-ethanol rather than having to purify it first, potentially keeping costs lower and production times faster. The PNNL and WSU researchers were trying to make hydrogen fuel from ethanol. To improve on a conventional catalyst, they had taken zinc oxide and zirconium oxide and combined both into a new material called a mixed oxide -- the zinc and the zirconium atoms woven through a crystal of oxygen atoms. Testing the mixed oxide out, PNNL postdoctoral researcher Junming Sun saw not only hydrogen, but -- unexpectedly -- quite a bit of isobutene (EYE-SO-BEW-TEEN). The researchers analyzed the chemistry to figure out what was happening. In the single metal oxides experiments, the zinc oxide created acetone while the zirconium oxide created ethylene. The easiest way to get to isobutene from there, theoretically speaking, is to convert acetone into isobutene, which zirconium oxide is normally capable of. And the road from ethanol to isobutene could only be as productive as Sun found if zirconium oxide didn't get side-tracked turning ethanol into ethylene along the way. Something about the mixed oxide, then, prevented zirconium oxide from turning ethanol into the undesired ethylene. 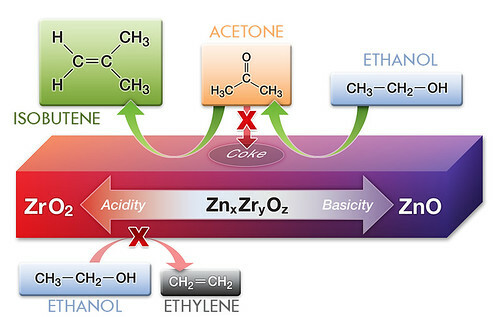 The team reasoned the isobutene probably arose from zinc oxide turning ethanol into acetone, then zirconium oxide -- influenced by the nearby zinc oxide -- turning acetone into isobutene. At the same time, the zinc oxide's influence prevented the ethanol-to-ethylene conversion by zirconium oxide. Although that's two reaction steps for the catalyst, it's only one for the chemists, since they only had to put the catalyst in with ethanol and water once. To get an idea of how close the reactions had to happen to each other for isobutene to show up, the team combined powdered zinc oxide and powdered zirconium oxide. This differed from the mixed oxide in that the zinc and zirconium atoms were not incorporated into the same catalyst particles. These mixed powders turned ethanol primarily into acetone and ethylene, with some amounts of other molecules and less than 3 percent isobutene, indicating the magic of the catalyst came from the microstructure of the mixed oxide material. Reference: Junming Sun, Kake Zhu, Feng Gao, Chongmin Wang, Jun Liu, Charles H.F. Peden, Yong Wang, Direct Conversion of Bio-ethanol to Isobutene on Nanosized ZnxZryOz Mixed Oxides with Balanced Acid-Base Sites, J. Am. Chem. Soc., July 21, 2011, DOI 10.1021/ja204235v. This work was supported by the U.S. Department of Energy Offices of Science and of Energy Efficiency and Renewable Energy. IIC, the Institute for Integrated Catalysis located at Pacific Northwest National Laboratory, is the largest non-industrial catalysis R&D organization in the United States. The IIC conducts catalysis science and engineering research aimed at the control of chemical transformations for a secure energy future.